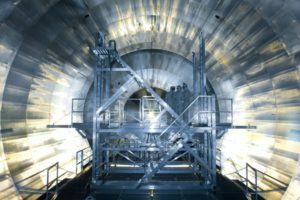 On June 11 the KATRIN experiment (Karlsruhe Tritium Neutrino Experiment) joined the fundamental search effort to determine the mass of neutrinos. What is the mass of neutrinos? To answer one of the most fundamental and important open questions in modern particle physics and cosmology, the KATRIN experiment was designed and built by an international collaboration at Karlsruhe Institute of Technology (KIT) in southwest Germany. A special Inauguration Colloquium on June 11 marked the start of its long-term data taking phase. KATRIN is a massive detector that has been designed to measure a neutrino’s mass with far greater precision than existing experiments. 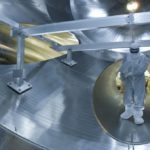 At the centre of KATRIN is a 200-tonne spectrometer, and scientists hope that with this new experiment they can start to collect data that in the next few years will give them a better idea of just how massive neutrinos can be. APPEC strongly supports the present range of direct neutrino-mass measurements and searches for neutrino-less double-beta decay. Guided by the results of experiments currently in operation and in consultation with its global partners, APPEC intends to converge on a roadmap for the next generation of experiments into neutrino mass and nature by 2020.